108 pages | 4 B/W Illus. Given the current economic climate and budget constraints facing schools, funding for professional development is continually reduced. And yet administrators still need to find methods to implement new instructional initiatives, such as the Common Core State Standards. This important book provides leaders with a high quality professional development approach at a low cost—the Peer Observation Process. Outlined in manageable steps, this strategy will help leaders implement any new school initiative or instructional method, no matter the context. Based on an established and successful program, this book outlines an effective approach that is easy to implement and will help schools increase student achievement, strengthen school culture, and improve job satisfaction. 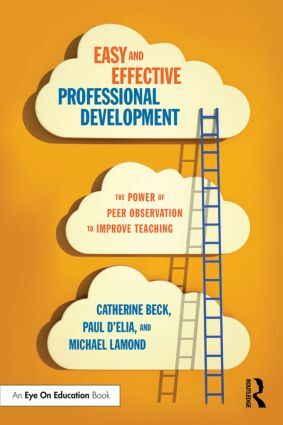 "In this timely and important book, Beck, D’Elia, and Lamond provide powerful evidence and practical solutions for the improvement of teaching. Most importantly, this is one of the very few books about teaching practices that draw a direct link between the strategies recommended and the impact on student achievement. " "I am honored to provide this full-throated endorsement of Easy and Effective Professional Development in which the authors provide educators with a clear road map for improving student achievement via a pragmatic teacher professional-development process that reliably improves teaching! … Structured peer feedback using the tactics described by Beck et al is a brilliant example of what noted school change expert Michael Fullan calls ‘organized common sense.’"
Foreword by Kevin Feldman, Ed.D. Meet the Authors. Preface. Introduction. Chapter 1: Sound Basis for Peer Observation. Chapter 2: What Does the Research Say? Chapter 3: Setting up the Program. Chapter 4: Success. Chapter 5: Keys to Communication. Chapter 6: So What About Common Core? Chapter 7: Four Years Into the Process. Chapter 8: Personal Stories of POP’s Influence. References. Appendices. Catherine Beck leads a dual language International Baccalaureate elementary school in Summit County, Colorado, and is an adjunct professor at Concordia University. Paul D’Elia is the co-founder of Shelf Leadership, LLC, an organization dedicated to expanding leadership education opportunities for high school students. Michael Lamond teaches language arts at a turnaround middle school in Denver, Colorado.